If you are looking for a way to stay updated on the latest news while away from the computer there are several apps that can give you news from many different sources. No matter what type of news you are interested in these apps will allow you to see news in many different topics including news from Social Media. Here is my list of the best mobile news apps these are all free and available on both Android, iOS, and through the web browser. Flipboard offers a visual experience for news readers that include a user interface and flip animation when browsing stories. Flipboard includes many different news categories that you can view through and if you create an account you can add your Social networks to get news from Facebook and Twitter. The reason I use this app on both Android and iOS is I like the feel of using it and flipping through the news stories it also works with videos without opening another app which I find really useful. Flipboard is a free app on the Play store and App store and you should download and try it to see if you like the concept of flipping through your news articles. Pulse is a very popular app for both Android and iOS which gives you a great dashboard with the latest news for many different topics. 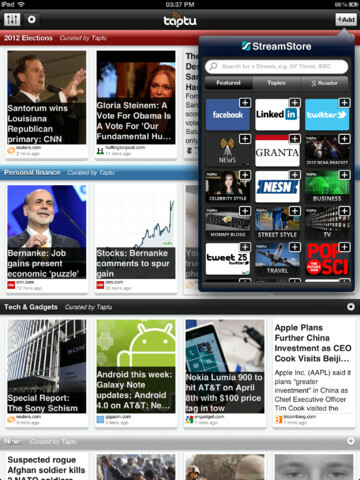 Pulse brings all your favorite blogs, magazines, social networks and newspapers in one place. Pulse gets it’s news stories from popular sources and can be configured to include news from other sources in that category. You can also save a news story to services like Instapaper, and pocket. This app offers a quick glance way to find and share current news stories. Pulse is free on all platforms and is a must have news app for anyone who wants to stay informed. Pulse has a 4.5 star rating on Play store which is very hard to do so they must be doing something right. Taptu takes all the news you want to get and creates and easy to read news stream for you to view. You can setup Taptu to get news from website, blogs and Social networks and share any news article you have read to Facebook or Twitter. A really great feature is syncing your bookmarks between multiple devices which make it easy to go from tablet to smartphone. 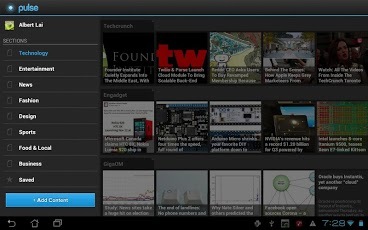 Taptu has categories but it also lets you create your own streams from blogs and web sites. Taptu is another great choice for people who want to follow news. Taptu is free and when you create an account you will be able to sync your bookmarks between PCs and devices.